The study focuses on the openness of judicial data in seven countries in Latin America. The judiciary continues to be among the least willing institutions to implement policies on transparency and access to information, generally because of their conservative tradition and lack of accountability practices. The study adopted an exploratory design in order to analyze enabling country and judicial contexts for open data, as well as whether judicial data publication meets open data standards of accessibility, sustainability, re-usability and non-discrimination. Study results show that even though access to judicial information is increasing and that there is also an increase in transparency policies for the judiciary, the publication of judicial data in open formats is still infrequent. This research seeks to build a baseline for an initial measurement that can be compared with future measurements, so as to be able to evaluate progress made in Latin American judiciaries. According to Transparency International’s Global Corruption Barometer 2013, the judiciary is the third most corrupt institution in the world (after political parties and the police). In recent years, numerous initiatives have been undertaken globally to promote open governments, access to information and transparency (Naser, 2012). Nevertheless, the judiciary continues to be among the least willing of the public institutions to implement policies supporting openness, generally because of their conservative values and a general absence of a culture of accountability (Elena, Aquilino, & Pichón Riviere, 2014). Institutions such as the judiciary play a critical role as stable, enduring social arrangements that provide the rules, practices and structures that shape the public agencies in which society trusts to disburse their public service responsibilities. However, we are living at a time in which trust between society and public institutions is strained. Citizens are wresting control from public institutions to improve their daily lives and, as they do so, it is critical to restore and maintain trust between citizens and public institutions (Castells, Forthcoming) (Castells, Chacón, & Himanen, 2014). Open data is often touted as having the potential to increase transparency and, in so doing, to enable citizens to hold public institutions more accountable for their decisions and actions. Open data also holds the promise of increased public participation in the governance of public institutions. In others words, instead of being confronted by and potentially being immobilized by a fearful and frustrated citizenry, public institutions can restore trust by becoming more open as a means of engaging with citizens. Dyson, for example, suggests that public trust in the justice system can be achieved through public scrutiny. Dyson regards the principle of open justice as essential and emphasizes the importance of new technologies as an enabler: “We now live in a technological age. We have the means to enhance public access to the courts. If we want justice to be truly public, for the courts to be properly open, we will have to continue to build upon recent advances and utilise that technological [sic] as far as we can, as far as is consistent with our commitment to making sure that justice is done” (Dyson, 2013). According to Velicogna the new needs of a system that delivers justice generates “(…) a growing need for the capability of finding viable solutions, based on a basic understanding of the many levels of complexity of ICT implementation in the courts” (Velicogna, 2010). The Berkman Center for Internet and Society of Harvard University has further emphasized the need of taking advantage of new technologies in order to improve the efficiency of this branch of the state (Malone, et al., 2010). Open justice therefore appears to be strongly linked to the modernization of the judiciary. The judiciary must have access to new technologies and through the innovative deployment of such technologies improve public participation in judicial processes. Public participation in open governments generates a two-way relationship between the citizenry and the state. This new mode of communication, through the application of new technologies, facilitates multiple interactions between society and the state, and this translates into a more transparent, participative and collaborative relationship (Kaufman & Ozlack, 2014). Direct communication between the judiciary and citizens also allows for the removal of intermediaries, generating a more direct relationship between the public and judges (Reilling, 2011). Public participation may also help in finding new solutions to existing challenges, including how to reimagine current judicial systems (Lenaola, 2011). To assess possible degrees of participation, the International Association for Public Participation (IAP2) proposes a spectrum of participation. This spectrum (see Table 1) describes and provides examples of participation in the justice system. 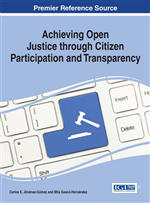 To achieve open justice, judiciaries are expected to move upwards through the spectrum using open data to improve the quality of public participation in decision-making processes.